One of the most depressing aspects of aging is loss of independence due to the body’s inability to flex and function as it once did. It becomes especially frustrating when one is unable to dress themselves. Fortunately, there are many dressing aids available for the elderly, disabled and wheelchair users that can extend dressing independence for many years. Age is not the only disabling condition we may face either. After a surgery, this can greatly impact the ability to outfit ourselves with clothing, socks and shoes, especially after hip or knee surgery. The most versatile type of assistance is found in the dressing aid sticks, which usually have two hooks, one in an S shape and a regular hook on the other end. The S shape hook end is very handy for removing clothing from closets or drawers, retrieving clothes from floors or reaching shoes that may be under furniture or beds. Both hook ends can also assist in putting on socks and shoes, as well as removing them. This dressing aid stick is very inexpensive, usually around $10 and can be an extra hand or long arm to assist in manipulating clothing while dressing. For someone who recently had hip replacement surgery, these dressing aids are a necessity. Here is a list of other dressing aids. Button hooks and zipper pulls are also very inexpensive and are of great help when stiffness or poor mobility of arms is a factor. Another essential aid, not only for dressing, but for many other uses is called a handicap reacher. This is a long handled, spring action grabber that is easily activated with a hand squeeze trigger. Handicap reachers can be used to help put on shoes, especially with the aid of a shoehorn. It also makes it much easier to retrieve clothing or other dressing articles that are too high or low to reach normally. Shoe horns are cheap and affordable shoe removal devices. Simply slip the flatter end into the heel area of your shoes and use some leverage to pop the feet out. Deluxe Reaching Assistance Kit – This is an assortment of reaching tools in one package. Buy the whole difficulty reaching deluxe kit as a birthday or Christmas gift for a loved one. 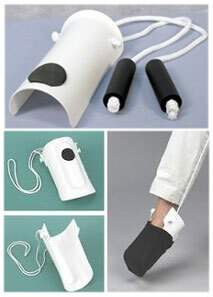 Flexible Sock and Stockings Aid – Here is a very affordable device to help put on your socks. Adjust the sock height and fix it to where you feel more comfortable with a handicap reacher. Zipper pulls for the disabled can aid those who are unable to grasp or reach the tiny zipper ends. They have hooks to assist the disabled with pants zippers or hard to reach back zippers. On the other end is usually a loop or a larger area to grab. There are also long handled zipper pulls for dresses when you cannot reach the back. In order to use a zipper pull, simply hook or attach the device onto the zipper ends and then pull to zip up or down. Women, who want to wear back dresses, but are unable to reach the zippers can use these zipper pullers to zip up. Long Shoe Horn in Blue – A long shoe horn will help you take off your shoes without bending too sharply at the hips and reduce strain. They are perfect for the handicapped in shoe removal. Dressing Aid Sticks – Dressing aid stick with two different ends, an S shaped side and a hook shape side. Use the hook on a dressing aid stick to pull up the sock to your desired length. 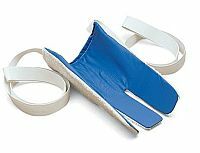 Another Sock Aid with Two Foam Grip Handles – This device consists of a hard plastic and two strings for pulling and sliding the plastic off the sock. Clip and Pull Pants – Clip and pull for pants. The process is simple; you clip onto your pants and then pull it up. The clips hold very tightly to the pants, skirts or dresses. Button Hook and Zipper Pull Combination – This hook and zipper pull tool is able to work on a variety of button sizes and holes. It can fit into small shirt collar holes. This is a perfect shirt buttoning aid for the handicapped. Firm Grip Button Hook – This is only a button hook but has flexible rubber gripping that assists those with arthritis or weaker hands. There are also inexpensive sock aids that make it effortless to put on socks unassisted, even when bending or mobility is restricted. These sock helper aids will provide the disabled much needed assistance when putting on socks. They help the elderly pull up socks without straining over. Those who have trouble reaching down to their feet can also use these devices. A sock aid consists of a hard plastic piece in the shape of a half circle and two strings to slide the piece off. No longer do you need any large socks, any standard sized socks will work. Another aid is a handicap reacher that can be used to adjust the edges of the socks once the feet are in place. Here are the simple steps for putting on your socks. Put your sock over the handicap sock aid so that it expands the opening of the sock. Then place your foot into that sock hole as much as possible. Make sure your heel is well covered and then pull slowly on the device. The rest of the sock should fall into place. If you are wondering is there a tool that helps pull up long compression socks for the elderly, then consider using a stocking donner. Putting on compression socks can be a long difficult process especially for those who are unable to get a firm grip on the socks. 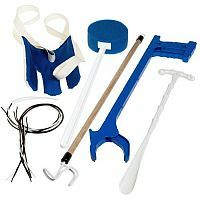 There are also grabbers (handicap reachers) and sock aid sticks that can be used to pull socks up if you are unable to reach or bend at the hip. There is a lesser known pants clip dressing aid for the disabled, called the Clip and Pull, which attaches to pants, undergarments or skirts while seated and then easily pulled into place, even using just one hand and are available for around $25. This is the tool to help pull pants up. Use this device to help pull up pants, skirts, shorts, boxers, underwear, jeans and whatever else you have trouble reaching down and pulling up. With all the excellent, durable and inexpensive aids now on the market, dressing independently is possible for most any disabled person. This helps to maintain dignity, which is an important factor in a happy lifestyle. Check out the handicap bathing aids and the handicap cooking and eating aids available to assist you independently throughout the home.